Acting as an offshoot to the main WWE releases, 2016 Topps WWE NXT Wrestling celebrates the biggest names of the developmental division. The online exclusive includes one autograph per box. Covering both the current roster and those that have moved on to the big time, the 50-card base set includes 23 NXT subjects and another 27 names as part of the NXT Called Up subset. Base parallels take the form of Bronze (#/50), Silver (#/25), Gold (#/10) and Red (1/1) editions. Every box contains five base cards. 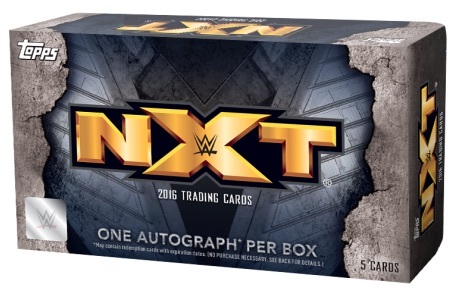 The only other possible pull in 2016 Topps WWE NXT Wrestling, on-card Autographs fall in each box. The 24-card set features the first Topps autograph cards for wrestlers like Andrade "Cien" Almas, Johnny Gargano and Tommaso Ciampa. Signed parallels mirror the base offerings with Bronze (#/50), Silver (#/25), Gold (#/10) and Red (1/1). 2016 Topps WWE NXT Wrestling boxes sell for $24.99 and are available directly through the Topps site starting on December 14. 50 cards. Shop for boxes on Topps. PARALLEL CARDS: Bronze #/50, Silver #/25, Gold #/10, Red 1/1. 24 cards. 1 per box. Shop for boxes on Topps. Awesome autograph checklist and great price point with an auto in every box. Between this set and Divas Revolution, it’s nice to see WWE offering the opportunity for quality autograph hits at an affordable price. Kudos!